The Downtown Sailing Center, in collaboration with SailMakani and Captain Bob Baginski, is pleased to offer TOP NOTCH US Sailing Basic Cruising Certification Courses. Capt. Bob has been coaching US Sailing Basic Keelboat courses at the Downtown Sailing Center for over a decade. He has been intimately involved in our Keelboat Education program during that time and has taught well-over 100 students to sail in that time. Let him teach you the basics of Cruising through US Sailing's Basic Cruising Certification Course. Bob will be teaching the Basic Cruising Course aboard MAKANI, a Bavaria 38. With roller furling for both main and jib and spacious accommodations above and below decks, MAKANI is the perfect training vessel for your Cruising Course. 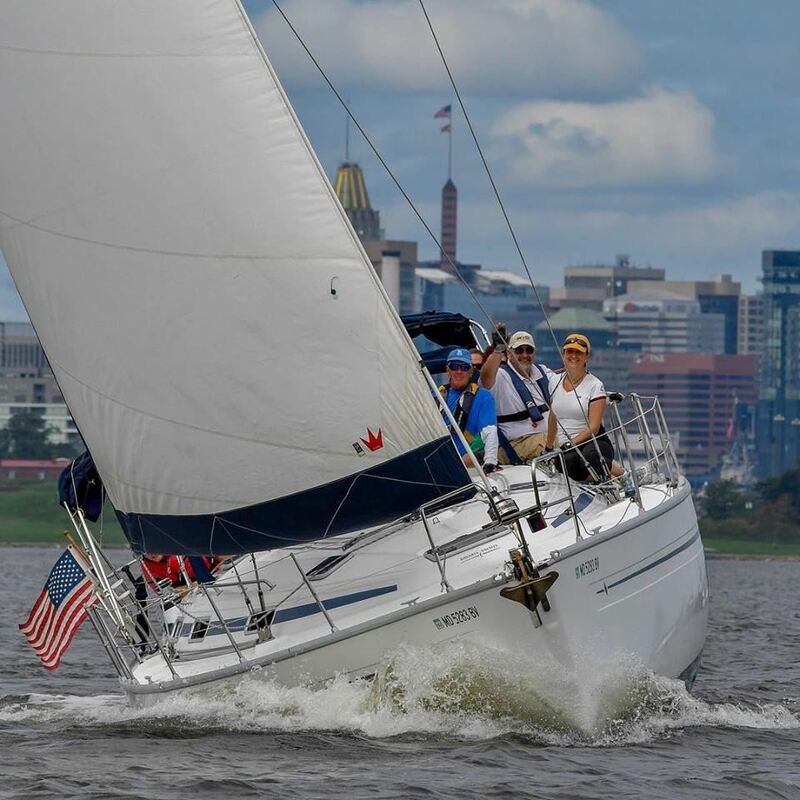 Launching out of Markley's Marina in Essex, Baltimore County, Maryland, Captain Bob's Basic Cruising Course will be the perfect opportunity for sailors who have graduated from the US Sailing Basic Keelboat Course who are ready to develop cruising skills. For more information about the US Sailing Keelboat Program, click HERE. For more information about the Basic Cruising Certification Course, click HERE or check out more info below. Courses are held over two full weekends and graduates who complete the certification course should finish the class with familiarity of engine systems, electrical systems, and how to daysail and overnight a small cruising sailboat. The program is open to three (3) students at a time with a course minimum of Two (2) students. Prerequisite for the course is proof of completing the US Sailing Basic Keelboat Certification Course. Persons born on or after July 1, 1972 must also provide proof of valid Maryland Safe Boater Certification (or equivalent), which can be earned at no cost to you through Boat US Foundation's program. For a list of requisite skills for taking the Basic Cruising Course, click HERE. These educational events are structured to provide informal and free training opportunities for the cruising crew members interested in becoming a DSC skipper. These day long events, led by volunteer cruising skippers, emphasize basic skills and safety, and will allow participants to practice and improve their knowledge and skills, which are essential for an enjoyable and safe sailing experience. Specific classes on navigation, anchoring, reefing, engine repair, cruise planning, & towing. On-the-Water practical’s to build knowledge and skills for taking advanced certification courses. The education programs improve the cooperation for crew and skippers to increase their overall experience, skills and knowledge. Email Cruising@downtownsailing.org for more information about the DSC Cruising Education Programs. DSC cruising skippers have the necessary sailing resume and skill level to sail the DSC cruising vessels. DSC cruising skippers are expected to regularly volunteer as skippers for the scheduled cruising events, accessible-sailing program and for fleet-maintenance work parties throughout the year. Email Cruising@downtownsailing.org for more information about becoming a DSC Cruising Skipper.